Another week of high school football is upon us. Anything can happen in a week of football. Last week was one where Dorchester County teams were supposed to show their stuff. Summerville was hosting Wando; Fort Dorchester was hosting Goose Creek; and Ashley Ridge was hosting Stratford. In these three games combined, the three road teams beat the three Dorchester County schools by a combined 76 points, 104-28. Summerville lost 37-14 without their starting QB Sawyer Bridges, Ashley Ridge was blown out 49-14, and Fort D played well, but lost 17-0. You can't expect anything when we are talking about 15-18 year olds who are on momentum. That's why they play the games. It is amazing that after this week, many schools will be half over with their seasons. There were several other interesting games last week. Hanahan beat Cane Bay on Saturday afternoon, keeping their momentum going as they head toward region play; while West Ashley lost at Colleton County, who really needed a win. Berkeley had the week off. James Island won 31-6 at St. John's, moving to 4-1 on the year. Bluffton won at Whale Branch, but only by two touchdowns, 34-20. Walt Fagan of Hanahan and KJ Wood of Goose Creek were the two players of the week this week from the Post and Courier. Fagan threw for 329 yards in the win against Cane Bay. Wood had 11 tackles, recovering 2 fumbles in Goose Creek holding Fort Dorchester to just 99 yards of offense. Xavier Young of Stratford was Channel 5's player of the week, as he had 199 yards rushing and 4 TDs in their win. Before I get into this week's previews, I would like to offer condolences to a very sad loss that all have had in the community this week. Clemson sophomore political science major Tucker Hipps died on Monday after falling off a bridge near Lake Hartwell. There have been many remembrances of him over the past few days. 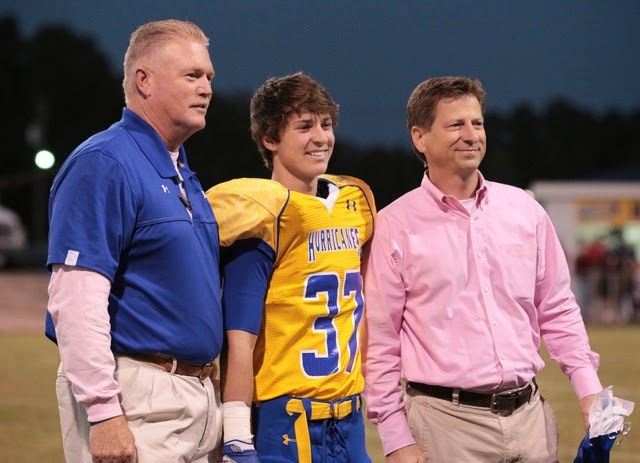 He was a Palmetto Boys' State counselor, but he also was a football player at Wren High School. He was a DB and LB for the Hurricanes from 2009-2012, and an honor student through HS and college. He was a model citizen. This is a sad loss not just for Clemson University, but for the entire state of South Carolina. Here is a picture of him at his senior night. Prayers to him, his family, his girlfriend Katie Clouse, and his many other friends. Now, on to the previews. A lot of teams are taking the week off because it is right before region play, so therefore there are fewer games. All games will be Friday night at 7:30 unless otherwise noted. 4A: Eastern Christian Academy (1-4) at Goose Creek (3-1): This game has been one planned in the works for years. Eastern Christian is based out of Elkton, Maryland, near Wilmington, Delaware. The team is filled with prospects. One of them is QB David Sills, who signed with Southern California in 7th or 8th grade. However, he has switched to West Virginia. He has been hurt the past few games, so the Honey Badgers (like Tyrann Mathieu) have had to rely on a backup QB. ECU had to play three straight games in Texas, losing to Trinity, Desoto and Coppell. In the season's first game, they defeated Spartanburg 58-56. Eastern has several major prospects alongside Sills, including WR Freddie Canteen, who is going to Michigan. Another prospect, Neiko Cramer, is going to Tennessee. They will have to face a tough opponent in Goose Creek, one of the best teams in the Lowcountry, and they definitely showed it after last week's game. Can they continue their winning ways? Ashley Ridge (4-1) at Cane Bay (2-3): Both Ashley Ridge and Cane Bay suffered tough losses last week. AR losing to Stratford was a surprise, even though Stratford is the more established program. AR had scored at least 27 in their previous four games, but only scored 14 this game. They trailed 49-0 at one point in last week's game. They hope to bounce back this week. Cane Bay, on the other hand, has played very close in all five of their games so far. Them along with James Island are the two most improved teams in the area. The Cobras are not home again after this for four weeks, as they face a bye week next before region play, then a stretch at Stratford and at Goose Creek before they host James Island on October 24. AR and Cane Bay have played since they started as schools, so this is always a good game. Who will come out on top? Bishop England (0-4) at James Island (4-1): James Island, the other surprise team in the Lowcountry this year, is 4-1. Even with the schedule they have played (only 2 4A teams), they have still played well, with the only loss to Ashley Ridge. They have wins over Hanahan and Colleton County, both surprises. This week, they face Bishop England for the first time since 1996. It is hard to believe that the Trojans haven't played Bishop England in football in that long, as they share some of the same territory, and both have good fan bases. Bishop England hasn't started 0-4 in a season since 1997. They hope to get their first win of the season in this game, while with a win, the Trojans would start 5-1 for the first time since 2000. This will be an interesting battle. Hanahan (2-2) at Stratford (2-2): Both Stratford and Hanahan had nice bounce-back wins last week. These 2-2 football teams will battle in Goose Creek Friday night in a game where the winner will go over .500, and gain momentum. Stratford travels to Summerville after this, who looks much different after last week's loss. Hanahan starts region play next; they had an early bye week. The QB battle between Fagan and Jameson Mobbs of Stratford will be one to watch for. This will be a tight game. Fort Dorchester (4-1) at Wando (3-1): A battle of one-loss teams in Mount Pleasant. One of the better games of the weekend. Both teams will have their second to last tuneup before region play begin in two weeks. Wando have won two straight in gritty fashion, as Coach Jimmy Noonan has brought a tough brand of football east of the Cooper. Fort Dorchester had a tough night last week, but held the vaunted Goose Creek offense to just 17 points. This game, with most of Wando's weapons (including QB Bailey Hart and RB Kenny Waring) will be a humdinger, with a lot of great skill position play. Fort D is known for defense, Wando offense. The winner gains more momentum heading towards region. Summerville (3-2) at West Ashley (2-2): Summerville, in two games, has gone from one of the best teams in the state (when they are healthy) to struggling to field a full starting offense. It was a big surprise when Wando blew them out at home last Friday night. Wando had beaten them a few years back in Summerville, but it was a close game until the 4th quarter. This game was a blowout during the entire 2nd half. West Ashley had a tough loss at Colleton County. After starting 2-0, they are now 2-2. The Wildcats have a tough task ahead of them, but they have beaten Summerville before at West Ashley. They did in 2011 when Caroline Cashion kicked a game winning FG to beat the Green Wave 10-7. Summerville will be angry. West Ashley also. The team that is angriest likely will come out on top in this one. Hilton Head (4-1) at Bluffton (3-2): Bluffton has bounced back nicely from their poor start, winning three straight games, even though it hasn't been amongst top competition. Hilton Head, at 4-1, starts their march toward the 3A playoffs with this game. Next week their region play begins at Hanahan. This rivalry is an underrated one around the state, as most of the Hilton Head and Bluffton kids know each other, and last year, Hilton Head won by one, 33-32, on a option pitch on a fake XP. This will be a great one. Colleton County (2-3) at Stall (1-3): Colleton County makes a rare trip to Stall this week. The Cougars had a big win last week in order to get back after losing three of their first four games. Stall is 1-3, and they are looking for an upset on their home field. Colleton County has just two home games after this, South Aiken and Ashley Ridge in the next two weeks after this game. 3A: Loris (4-0) at Georgetown (4-0): Undefeated Loris travels to undefeated Georgetown in a big game in the Grand Strand area. This is the last game before region play for both teams, as region starts next week in the Myrtle Beach area. Beaufort (2-2) at Manning (3-1): Beaufort makes the long trip to Manning Friday night. They've shut out their last two opponents, Whale Branch and Battery Creek, 21-0 and 51-0. They start region play next week at home against Berkeley. Richland Northeast (0-4) at Orangeburg-Wilkinson (4-0): Orangeburg-Wilkinson goes for a 5-0 start on Friday night. O-W has given up a whopping 16 points in their first four ball games. The most they've allowed is 10 to Colleton County. 2A: Burke (0-4) at Academic Magnet (3-1): Academic Magnet has had a very good few weeks. RB Nate Schlosser has run for 759 yards in the last three games for the Raptors, including 190 last week in a 34-0 win over Baptist Hill. Magnet is going for a 4-1 start this week while Burke is going for their first win of the season. Battery Creek (1-3) at Ridgeland/Hardeeville (2-2) (Thursday, 7:30): Another Thursday night TV battle this week, between two teams in opposite directions. Ridgeland beat Military Magnet 48-0, while Battery Creek lost 51-0 to Beaufort. Ridgeland hopes to continue their momentum. This game will air on WSAV's MyTV channel, and WSAV Sunday morning. Baptist Hill (0-4) at North Charleston (1-3): Baptist Hill still only has twelve points on the year from four games. They will travel to 1-3 North Charleston this week; the Cougars lost last week at Branchville 48-30. Both hope for a bounce back. Whale Branch (0-4) at Windsor Forest (GA) (0-4): Winless Whale Branch and Windsor Forest play each other in Savannah Friday night. This game is Windsor Forest's homecoming. Windsor lost last week at Screven County (who played St. John's earlier in the year), 36-8. Andrews (2-2) at Hemingway (4-0): Andrews heads to undefeated Hemingway in an important game, as Hemingway won at Johnsonville last week 14-9. Berkeley (1-3) at Timberland (5-0) (MyTV Charleston): Berkeley and Timberland are rivals of each other as they are two of the most established programs in Berkeley County. Berkeley has struggled this year, losing three straight after a win against Johnsonville, while Timberland is undefeated this year at 5-0, hoping for a sixth win in a row. Andrew Miller (Post and Courier HS football reporter) and Scott Eisberg discussed how this was a battle between a long-time power (Berkeley) and a little guy (Timberland) who hasn't been around a while. Both were expecting the little guy to win. We will see Friday night at 7:30. 1A: Lincoln (2-2) at Branchville (2-2): A battle of 2-2 teams getting ready to start region play next week. Will be a good game. Cross (2-2) at Lake Marion (2-2): Strangely, after Cross lost their first two games at home, they won the first two games of their five-game road swing, and are now at .500. Lake Marion blew out Burke last week, 56-6. This will be a good battle. Military Magnet (1-3) at Scott's Branch (1-3): Military Magnet had a tough week last week, losing 48-0 to Ridgeland-Hardeeville, while Scott's Branch lost 27-0 to Cross at home. They battle this week. SCISA: Colleton Prep (3-1, 1-0) at St. Andrew's (1-3, 1-0): Colleton Prep won this by two touchdowns last year. Thomas Heyward (2-2, 1-0) at Dorchester Academy (1-4, 0-1): Dorchester Academy badly needs a win to avoid going 0-2 in their region. Curtis Baptist (3-1) at Hilton Head Prep (3-1, 4:30pm): Curtis Baptist of Augusta makes the long trip to Hilton Head to play Hilton Head Prep on homecoming. Hilton Head Christian (2-2, 1-1) at Bethesda (1-3): Hilton Head Christian makes the trip to Savannah to play Bethesda, in a battle of two high-scoring teams. Christian Academy (MB) (1-3, 0-2) at Northwood Academy (4-0, 1-0): Christian Academy heads over to Northwood's new stadium in what will hopefully be their first Friday night game. Heathwood Hall (2-2, 1-2) at Pinewood Prep (2-3, 0-2): Pinewood Prep and Heathwood Hall continue region play this week. Pinewood lost last week against Ben Lippen. Porter-Gaud (3-2, 1-1) at Ben Lippen (3-2, 2-2): QB Kris Johnson, one of the best SCISA QBs in state, and the Cyclones head to Columbia to face that same Ben Lippen team. 8-Man: Cathedral Academy (2-2, 2-0) at Beaufort Academy (1-3, 1-2): Cathedral puts its undefeated region record on the line as they travel to Coach Scott Richards and Beaufort Academy. St. John's Christian (2-2, 2-1) at Charleston Collegiate (1-3, 1-1): Charleston Collegiate and St. John's Christian will play in a competitive region game. Coastal Christian (0-5, 0-3) at James Island Christian (0-4, 0-3): Homecoming at James Island Christian as the two schools battle for somebody's first win of the season. Faith Christian (4-1, 3-0) at Greenwood Christian (4-0, 3-0): One-loss Faith Christian makes the long trip to Greenwood to play undefeated Greenwood Christian. Ridge Christian (1-4, 0-2) at Patrick Henry (4-1, 3-0): Patrick Henry, one of the best SCISA teams in the state, hosts Ridge Christian this week. Hope the weather holds off, and enjoy the games!